Morning: Pick up at Hotel and transfer to Ben Tre river pier. Take a boat trip along the Ben Tre river for sightseeing the local people’s activities: fishing - net. Stop over to visit the local coconut work shop, finding out how to process the products from coconut by handicraft method. Walk along countryside lane to see the coconut first – processing workshop, milk rice paper cake and hand I crafts from coconut wood And interesting experience with predicable drawn by a motorbike which brings you follow the coconut groves, rice fields and farm produce. Sightseeing a household make straw mat. Stop over at local people house, relaxing and enjoying local lunch. Then continue to take rowing – boat along canal with thick and interminable coconuts to river estuary. As your journey ends, you will return to Ben Tre river pier by motorized boat and then travel to Can Tho. Check-in Victoria hotel and stay overnight in Can Tho. 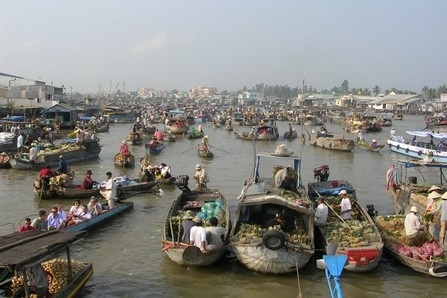 Included: Private transport, boat trips, entrance fees, English speaking tour guide, lunch, 01 Aquafina water bottle and accommodation in Can Tho (Victoria Hotel). Excluded: Breakfast, dinner, drinks, travel insurance, tips and personal expenses. 09.30am: Set off to local market where Mekong Delta season fruits, vegetables, herbs and spices are introduced. 11.15am: Return to hotel for relaxing and refreshing. 13:30pm: Sit down at the kitchen VIP table and enjoy the self-prepared lunch. Included: Private transport, boat trips, entrance fees, English speaking tour guide, cooking class program, breakfast, lunch, 01 Aquafina water bottle and accommodation in Can Tho (Victoria Hotel). Excluded: Dinner, drinks, travel insurance, tips and personal expenses. Then private transport will pick you up from hotel and take you to Saigon - Ho Chi Minh City. Arrival Saigon. Finish Mekong River Tour and Cooking Class from Ho Chi Minh City 3 Days 2 Nights say goodbye and see you. Included: Private transport and breakfast at hotel. Excluded: Lunch, dinner, drinks, travel insurance, tips and personal expenses.